QPR went down 1-0 at Blackburn this afternoon, conceding an injury-time winner from Sam Gallagher. The game looked to be heading for a goalless draw before Gallagher pounced on Marvin Emnes’s centre from the left byline to sweep the ball beyond Alex Smithies from close range. 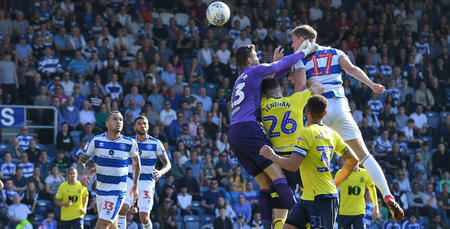 It was harsh on Rangers in a game of few clear-cut chances for either side, and they were left to rue a crucial decision by referee Tony Harrington after he failed to spot that Conor Washington’s header midway through the second half had crossed the line after crashing down off the underside of the crossbar. As the R’s players celebrated, they looked stunned as the match official waved play on. Ian Holloway went with the same starting XI that picked up that impressive point at Newcastle United on Wednesday night. It meant Alex Smithies lined up between the sticks, with the three centre-backs of Joel Lynch, James Perch and Nedum Onuoha. Jake Bidwell played as a left wing back, with Darnell Furlong doing likewise on the right. Ryan Manning and Massimo Luongo continued in the centre of the park, with Jamie Mackie, Conor Washington and Pawel Wzolek operating across the front line. After being ineligible to feature at St James’ Park, recent arrivals Matt Smith and Ravel Morrison were named on the bench. Blackburn, meanwhile, made one change from the side that lost 2-1 to Leeds United here at Ewood Park three days ago, with Craig Conway replacing Derrick Williams. Rovers succumbed to a last-minute winner against Garry Monk’s promotion chasers, and went into this afternoon’s game looking for only their second win in 11 league fixtures. It’s a run of results which left them three points adrift of safety, and only served to add to the importance of this fixture, at home to a side just five places above them in the table. 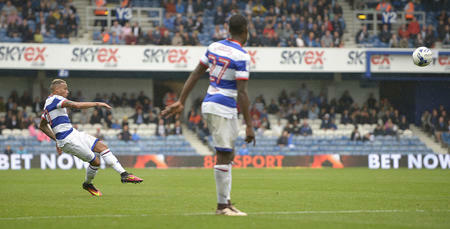 Mackie almost gave QPR the lead within the first minute after a brilliant start by the R’s. Manning won possession in the centre of the park before spraying a lovely ball to the right, where Washington picked up possession. The Northern Irishman pulled the ball across the face of goal for Mackie, but his shot from eight yards was well stopped by Jason Steele in the Rovers goal. Seconds later, it was the turn of Luongo to go close, but his effort at the near post was deflected wide. From the resultant corner – and still in only the second minute of this game – Joel Lynch’s goalbound header from Manning’s delivery was tipped over the bar by Steele. It was a high-tempo start by Rangers, and certainly led to a few disgruntled voices amongst the home supporters. The hosts settled into the game, however, and Conway’s cross to the far post from the left found Liam Feeney in space, but his shot from 18 yards drifted wide of Alex Smithies’ post. On ten minutes, more good work from Manning found Washington in space on the left. He cut inside and saw his fierce drive from 20 yards deflected wide. 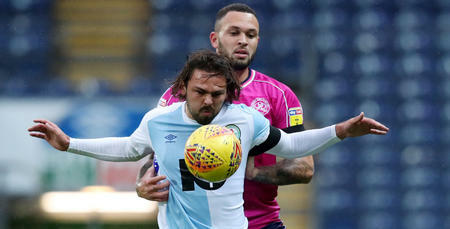 Having scored two in his previous two appearances, Washington began this game with a real confidence to his play, keen to get on the ball at every opportunity, with his movement causing the Rovers rearguard plenty of problems. QPR were also snapping into the challenges, with Perch and Luongo in particular putting in some strong tackles as they looked to wrestle control of this game. On 32 minutes, brilliant pressing by Luongo retrieved possession for the R’s on the edge of the Blackburn box, and the ball fell invitingly for Manning who saw his drive whizz past the far post. As in recent weeks, Rangers looked dangerous when they went forward, with the energy of Wszolek, Mackie and Washington proving to be a real handful. The hosts had a great chance to take the lead on 35 minutes, however, when Sam Gallagher was afforded space in the box, but he could only direct his header wide following Conway’s corner. Charlie Mulgrew’s freekick from 25 yards was comfortably gathered by Smithies towards the end of the opening half, as Blackburn finished on the front foot. After a slow start to the second half from both sides, Washington tried his luck from distance after a neat through ball from Manning in the 53rd minute, but his low drive went a foot wide of the near post. On 61 minutes Washington thought he had given Rangers the lead. Furlong’s long throw from the right was flicked on by Lynch, and the R’s forward headed the ball off the underside of the crossbar before it bounced down and appeared to cross the line before being cleared. The R’s players - and fans behind the goal - celebrated, but referee Tony Harrington was unmoved and didn’t award the goal. Replays certainly suggested it should have been given, and would have been Washington’s third in as many games. Holloway made his first substitution moments later, handing Smith his debut at the expense of Mackie. On 67 minutes, the hosts created their best chance of the afternoon so far when Darragh Lenihan got on the end of a great free-kick into the box from Connor Mahoney, but his shot was parried by Smithies, while Feeney hit the rebound wide. The game certainly opened up in the latter stages of the half, with both sides looking to win the game. Washington was next to go close, this time his volley going just wide. At the other end, Rovers sub Hope Akpan fizzed a 20-yard drive just over Smithies’ crossbar. With just under 15 minutes remaining, Morrison was brought on to make his first appearance for QPR since returning to the club, replacing Luongo. And on 84 minutes Morrison’s set provided Perch with a great shooting opportunity, which he duly took, but his effort was straight at Steele, who was able to parry the ball away. As the game looked to be heading towards a goalless draw, Gallagher pounced to seal all three points for the hosts. Emnes broke clear down the left and pulled the ball back across the face of goal for Gallagher, who swept the ball beyond Smithies. It proved to be the winning goal, making Washington’s disallowed ‘goal’ all the more difficult to take. 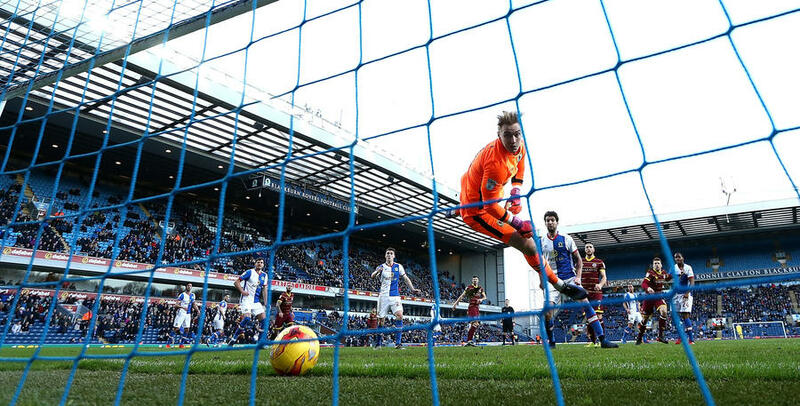 WATCH all the main moments from QPR's match against Blackburn Rovers.